It’s no secret that soft skills have become increasingly important in the workplace, and yet many businesses are struggling to find candidates possessing these skills.This is particularly true in the service industry, an area notoriously plagued with high turnover. Penn Foster recently surveyed leaders in the hospitality, retail, and restaurant industries to better understand the value of soft skills at their organizations. The survey examined the importance of these skills, where soft skills gaps exist, and what existing soft skills training employers provided for both entry-level employees and front-line supervisors. In analyzing the survey results, it became clear that soft skills are seen as critical for entry level employees in the service industry. Over 79% of respondents said that soft skills were important or very important to an employee's overall success at their company. Likewise, when asked to rank the importance of training for entry level employees across a number of workplace skills, employers ranked soft skills such as communication, customer focus, teamwork, respect, and professionalism as the most important. Somewhat surprisingly, these were ranked higher than job specific functions such as industry knowledge, technical skills, and even safety training. While employers clearly value soft skills, it unfortunately appears these skills are lacking in the labor market. 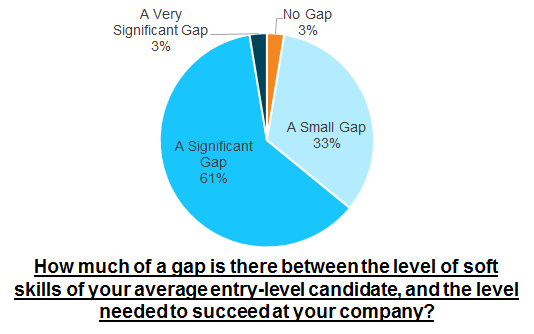 Over 64% of respondents said there was a significant gap, when comparing the level of soft skills of the average candidate to the level needed for success in an entry level role, with an additional 33% stating that there was a small gap. While employers clearly understand the importance of soft skills for their employees, and the skills gap for new employees, companies are reluctant to incorporate soft skills into their formal training for new employees. In total, only 46% offered any sort of soft skills training for entry level employees. This was less than training on technical skills (59%) or industry knowledge (54%) - two skill areas that employers ranked as less critical to an employers success than soft skills. Of note, the vast majority of employers that did offer soft skills training did so through internally developed programs, as opposed to existing soft skills training solutions. Though many employers may not be offering entry level employees soft skills training right now, the may be changing going forward. 47% of employers not currently offering soft skills training are considering adding it the the future, primarily for customer facing employers. If the pool of applicants continue to lack the soft skills demanded by employers, expect this number of employers evaluating and offering soft skills training solutions to continue to rise. While it’s clear that soft skills are important for entry-level employees in the service industry, they are also increasingly important for existing employees to advance to first-line supervisor positions. When promoting internal talent to first-line supervisor roles, 59% of employers viewed soft skills as somewhat or very important when deciding on who to promote. Similar to entry level employees, there remained a large gap in employer expectations for soft skills compared to what the average supervisor candidate possessed. Over 59% of employers reported a significant gap, with a further 38% saying the was a small gap. Even more so than entry level employees, employers expect supervisors to possess soft skills, with only 40% of respondents offering any sort of soft skills training for supervisors. What is the role of training organizations? As our survey results demonstrate, soft skills are increasingly in demand for employees at all levels of the Service Industry, and the current applicant pool does not possess these at the required level. Which begs the question: what are training organizations, with a mission to prepare student & job seekers for employment, doing to address this gap? Stay tuned for our next blog post, which will explore what training organizations like career schools and youth organizations are doing to provide soft skills training for their learners.